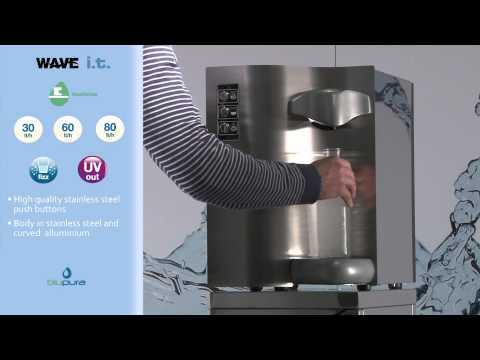 The elegant countertop water-cooler with touch screen commands, energy saving, sparkling water. Integrated “touch sensitive” commands are under glass for maximum hygiene. ENERGY SAVING, up 75% saving in electricity. 3 supply options: cold still water, room temperature water and sparkling water. Supply area and drip tray in stainless steel. Mechanical filter at inlet to protect hydraulic components. Easy access for inspection from above. Made entirely of stainless steel. Automatic alarm system signals: no water – no CO2. UCV lamp at exit (4w). Gas R290 (only for 60lt/h). A flat, elegant control panel: great design and unrivalled practicality for easy cleaning and maximum hygiene. The touch screen controls are all under glass and the absence of mechanical buttons allows for simple cleaning with the wipe of a sponge! Compact, powerful and built entirely in stainless steel, the smallest of the Blupura water coolers! The elegant countertop WAVE with stainless steel command buttons. The water cooler for office with hot water too!